Betty Crocker's Fun da-middles provided the perfect excuse to use my new hand mixer. The hand mixer was a birthday gift to myself. Hand mixers are very inexpensive (I paid $6 at my local Walmart) and I've learned how handy they can be in the kitchen! I've baked many cakes and noticed a difference when using the mixer. The biggest thing I noticed was the batter was less lumpy and fluffier. I was skeptical that there would be enough batter for 12 full cupcakes. I rarely squeeze out 12 cupcakes when using one box. Perhaps the mixer and measuring with a large spoon helped. -In a large mixing bowl, I added the cupcake mix, 2 eggs, 3/4 cup of water, and 1/3 cup of cooking oil. I slowly mixed the combined ingredients together while the oven preheated. -In a 12 cup muffin pan, I added a paper cup inside of each slot. -With a large spoon, I scooped a heaping spoonful of batter into each cup. Make sure that you wash your hands as you may need to use your fingers to help scrape the batter from your spoon. -Snip the corner off of the filling packet and divide filling between all 12 cupcakes. I had to use my fingers. The filling was sticky and had a texture of marshmallow fluff. I stole a taste of the filling and the fluff is the best way to describe the taste. It wasn't too sweet and overwhelming. -Divide the remaining batter over the 12 cupcakes. Be sure to cover the filling. -Bake in the oven until the top is light golden brown. When I bake cakes and cupcakes, I like to touch the top and many times it's finished baking when it feels spongy. Other times, I use a toothpick. Due to the filling in the FUN da-middles, it's difficult to check them with a toothpick. I pulled the pan out of the oven and let them cool for a few minutes. I noticed the features don't quite look the same as the box when I tried to cut the cupcake open. It might have been too hot to cut with a knife at that time. Didn't matter! My mouth watered with anticipation. At that moment, I longed for the delectable, sweet goodness sitting in front of me. Normally, when it comes to most baked goods, I have to pass. Living with toothaches can be torture. These cupcakes however, had a light vanilla taste and didn't taste like pure sugar. Want to know a secret? SSshhhhhh.....you cannot tell anyone....I ate TWO!! MANDATORY ENTRY: MUST BE ANSWERED FOR A CHANCE TO WIN! Please share an upcoming event or gathering at which you would most like to debut the new Betty Crocker Fun da-middles cupcakes? *Visit We Use coupons through the banner on the sidebar. * Watch Betty Crocker’s YouTube page. 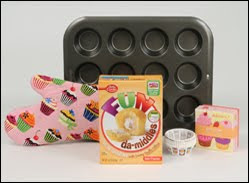 The giveaway has been offered by Betty Crocker through MyBlogSpark. I was compensated with the same gift pack. All opinions are mine and unbiased. I hold no responsibility other than communication with the sponsor in getting your prize. I'd love to make these for my son's birthday later this month! I like Betty Crocker on facebook as m patricia gabriel. I would take these to a Halloween party. I would make them for my son's birthday. I think every day can be a holiday :) I would surprise my sister with these on some random day of the week when she wouldn't be expecting it! My girlfriend's sister has a birthday coming up, so that seems like a good event to try these out! I follow your blog on GFC and like Betty Crocker on Facebook! I would love to win this for my family! We will use them for my daughters' welcome home party when she gets leave from the Army! Thanks so much for the fantastic giveaway! We have 3 birthdays this month. They would be great for any of them. I would like to make these for a Halloween party. I'd make them for my husband's birthday. I would make these for our annual Halloween party. I would like to make them for my grandson's birthday next month. I would like to make these for the next family get together. YUMMY. yumm! i would make these for my halloween party! I would love to make these for my husband's birthday. I would take them to our halloween party. I would make these for a weekend treat. I like betty on FB - aleksandra n.
I'd make these for Halloween. I follow Betty Crocker on twitter @Aerated. I follow you on twitter @Aerated and tweeted. Thank you! I will be having some friends over for coffee soon. It would fun to serve these then. Is it wrong to want these for my B-day! I''d like to make them to take with me when I work the polls. I am going to a girl's night out at a friend's house next weekend. I would love to bring Fun da Middles with me. I visited We Use coupons. I follow Betty Crocker on Facebook. I am a Twitter Betty Crocker follower. There is a bake sale coming up at the school in a few weeks. These would be great. I follow Betty Crocker on Twitter. I would introduce these at my hubbys bday party coming up!! He loves anything with creme in the middle so this would be awesome! I'm curious how they taste also. Visited "We Use Coupons" through banner! We're having a birthday party coming up for one of my nieces, and this would be perfect! Following Betty Crocker with Facebook. Following Betty Crocker with Twitter. My best friends 50th birthday!! I got selected to host a Twister Mania Xbox360 Kinect party on November 5th. I would love to make the Betty Crocker Fun da-middles cupcakes for the party. I could probably dye frosting red, blue, green, and yellow to make the cupcakes look like a twister mat. They would be fun to serve at my daughter's birthday party in a few weeks. I would love to bake these for my Halloween party. I would love to make these for Thanksgiving! I always make cupcakes for the kids dessert, and I could easily add fall colors to the filling to make them festive! I would like them for our upcoming Halloween party. Following BC via Twitter (@Hotsnotty2), Thanks! I would love to use these for one of my daughter's sleepovers. She usually has one every 6 weeks or so. Love doing fun things like this with the girls! Following you and twitter and tweeted! I am going to be making these this coming Friday for a bake sale at school. These would be great to serve at my niece's birthday party! She would love them. i Visited We Use coupons through the banner on the sidebar. I'd like to take them to Thanksgiving at our friend's house! I visited We Use Coupons. Neat site, I like to use coupons so this might be a good resource. These would be magnificent for the Halloween Sweet Table! My daughter's next Girl Scout troop meeting! I would love to make them prior to a hard day at work. My employees fall prey to baked goods bribery. I would like them for my son's birthday. I follow Betty Crocker on twitter(donnak4). These would be great to serve at the next family gathering.